< The British Sports Journalism awards…1948/9 style! As the countdown to next week’s British Sports Journalism awards gathers pace, PHILIP BARKER dips into the archives and reveals how the BBC went about recruiting a sports commentator in 1969. The SJA’S Sports Commentator award is always a keenly contested award but 50 years ago the BBC launched a competition of their own. The aim was to find someone to join Kenneth Wolstenholme, David Coleman and Barry Davies. As they prepared to cover England’s defence of the World Cup in 1970, it was Coleman who came up with the idea of a competition. 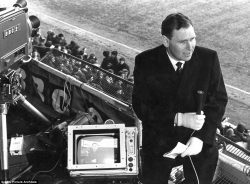 “In 1966 the only weakness in our World Cup coverage was in our commentating,” admitted BBC football director Alec Weeks. “SO YOU THINK YOU COULD BE A SOCCER COMMENTATOR?” asked the Radio Times in January 1969. “Sportsnight with Coleman is looking for an extra commentator. It’s no gimmick.The winner will join BBC TV’s present corps of established commentators for the 1970 World Cup. The winner was to be revealed live on Sportsnight with Coleman “the name will be announced of the MAN to supplement the present skilled squad of BBC commentators”. The numbers were whittled down by a process of auditions – “one of the most complex auditioning programmes ever attempted in BBC history,” said Leitch. Five hundred voice auditions took place in Belfast, Bristol, Cardiff, Glasgow, Leeds, Newcastle, Birmingham, Manchester and London. Carey was among the final dozen, invited to what the BBC described as “the most professionally demanding atmosphere of all, the actual commentary boxes at Wembley”. There, they commentated on England’s victory over Wales. Six commentators did so in each half and then waited for the deliberations of the judges. “It was, we all agreed, the nearest we would ever get to knowing how it felt in the finals of the Miss World contest,” mused Carey who later worked on Test Match Special. On May 22 1969, the familiar staccato theme introduced a special edition of Sportsnight with Coleman. That panel featured England manager Sir Alf Ramsey as chairman, sports minister Denis Howell, BBC sport chief Bryan Cowgill, footballer of the year Tony Book and Peter Black, the Daily Mail’s television critic, chosen “as a penetrating tv critic who is not a football man”. The rules of the competition had stipulated: “Strict anonymity will be observed until the final audition” but now the names were announced. The final six included Larry Canning and Tony Adamson, both to become familiar voices on BBC Radio sport. There was also Ed ‘Stewpot’ Stewart, presenter of radio’s Junior Choice and Liverpool and Scotland striker Ian St John who had been broadcasting for local radio on Merseyside. ‘’It seemed that Sir Alf would not have Ian St John at any price,” recalled Alec Weeks and suggested that the England manager even threatened to walk out on the panel and, more damaging still, withdraw cooperation at the following year’s World Cup. “The rest of the panel capitulated,” said Weeks. When the result was announced St John had only finished second and the winner was Idwal Robling. A Welsh amateur international, he had been chosen for the 1952 Great Britain Olympic squad but did not play because Great Britain lost in the opening match of a straight knockout competition to Luxembourg. Robling went to Mexico to commentate and was later to become a popular BBC commentator in his native Wales. One other finalist did make it to Mexico. Gerry Harrison was on the trip but he was working for ITV.